Fees: $120 » (Tucson special, normally priced at $200) includes all materials and shared use of instructor’s tools. Students wishing to have their own tools can purchase a kit. Cost - $70 and includes: saw and blades, file, wax, metal sheers, liver of sulpher, sand paper, drill bits, copper sheet. This class covers the basic techniques needed to create your own unique metal jewelry pieces . Each student will create a pendant of their own design incorporating all of the skills and applications covered in this intensive 8 hours of instruction. 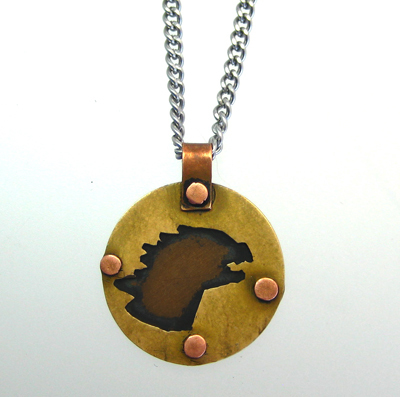 We will use a jeweler’s saw to cut out shapes, and use hammers and stamps to create a variety of interesting textures. We will cover finishing techniques with the use of files and sand paper. We will also learn the cold connecting techniques of tube riveting and wire rivets to easily join pieces. We will also have examples of applying a patina to darken metal pieces. This is an excellent class for art teachers wishing to earn certification in metal work.